There is a serious premise at the heart of ABC1's Compass documentary series The Mission, but for the most part it has been dressed as gimmick. Tasmania's Hobart Catholic Archdiocese is in crisis. Its priests are ageing, and their numbers dwindling. The congregations are, too — and dramatically so. The solution? In the words of the unofficial series tagline: 'Missionaries in reverse'. Three Nigerian priests, Fathers Felix, Christopher and Kene, are sent as missionaries to Australia's island state. After overcoming a fear that they will die from the cold, and enduring a month of 'enculturation' (they speak fluent English but struggle with Strine), each is posted to a remote corner of the state. The young priests see their three-year sojourn as mission in the literal sense; they are there to bring religion back to a land that, in their eyes, has lost its way. To them we are the 'other' to be helped and pitied. They are perplexed by miniscule congregations, which strangely surge only at Christmas and Easter. When Christopher attends the final Mass at a remote parish that is to be closed, he is visibly depressed, and horrified to learn that things are really so dire. Writer/director Varcha Sidwell makes a meal of juxtaposing the priests' Nigerian experience of Church — marked by thousands-strong congregations, colour, youth and vitality — with that of Tasmania, where sparse handfuls of glum-looking, elderly parishioners rattle their way dutifully through Mass in nearly empty churches. The contrast is vivid, but the point is superficial, particularly in the early episodes. Often, cultural differences are played for comedic effect (Felix is bemused to witness competitive wood-chopping and ferret racing; Kene sneers at a proffered sample of Vegemite) more than to explore the complexities of the missionary experiences. The third and fourth episodes are more contemplative. Christopher has trouble shaking patriarchal attitudes that, while usual in his home country, do not wash with the female receptionist at his parish. Felix struggles to understand why one young Catholic couple would want him to marry them on the beach, and not in a church. The Mission may be superficial but it's well-meaning, and it does attain moments of profundity. Most poignant is Father Kene's visit to the remote Big Dog Island in Bass Strait, to go mutton-birding with a mob of Aboriginal Australians. He visits an old chapel on the island — a 'sorry' place, he is told — that stands as a symbol of white missionary history and, by extension, of the broader impact of colonialism upon Indigenous culture. Kene is moved, perhaps to reflect upon points of difference and similarity between the historic missionary experience and his own, though the documentary does not pursue this line of thought. It's not the only time The Mission leaves interesting questions unprobed. One of the Tasmanian priests is cynical about this missionary 'experiment', and his pessimism segues into open conflict with Christopher. He is concerned that the time and energy spent on this 'stop-gap' would be more usefully channelled into encouraging more Australians to become priests. His valid questions are treated merely as stubborn grumblings. Felix, Christopher and Kene are disturbed that many Catholic parents send their children to Catholic school but not to Mass. This is contrasted with the structured religious lives of children in Nigeria, where one seminary has had to restrict its intake numbers to 90 per year — meaning some 800 are turned away. We may not agree with Kene's injunction that children should 'have no rights', but his underlying point about individualism is not lost. The Nigerians' experience of vocation is comprehensive. It is normal in their country to enter the seminary as a pre-teen and emerge as a priest 17 years later. Christopher remarks with pride that: 'Even my mother calls me Father'. His words contrast with the lament of one Tassie priest, that Felix insists on calling him 'Father' rather than 'John'. The impression is that the Nigerians have a reverence for their vocation that is not replicated in quite the same way by their more casual Australian counterparts. This inference probably sells Australian priests short. Episode 2 of The Mission airs at 10.05pm, Sunday 6 June on ABC1. Episode 1 can be viewed online. Anyone who doesn't love Vegemite should never have been ordained. On a more serious level, the buying of priests from the Third World is not a solution, what is needed is the total renewal of the seminary system in Australia which has reached the level of the abysmal. by happy coincidence, I read this piece after attending morning mass celebrating the lives of the Nigerian martyrs - a Mass celebrated by an aged Irish priest who has served on the Tasmanian mission for some 60 years. The Nigerian priests do expose their Aussie brothers of being too casual. But we seem to be drowning in a sea of casualness these days from casual relationships to casual employment. None of it good. God bless Fathers Felix, Christopher and Kene. Does the Pope love Vegemite? The answer to the question as to why Australians aren't entering the seminary is simple - why would would one work for an organisation with a reputation of abuse such as the Church? No matter how strong ones faith is, these abusive priests and sisters have destroyed the Church and its reputation. There is much to celebrate about the Church but it is overshadowed constantly by the actions of these abusers and will continue to do so until the last one is in prison. 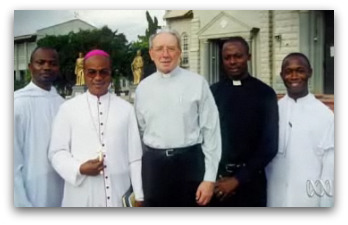 I'm sure there are quite a few Australian-born priests who would offer their services to the diocese of Hobart to help carry on the church's mission there and who would not suffer the loneliness and culture shock of the Nigerian missionaries. The only trouble is - from a blinkered church view - they are all married. A crucial observation about our Oz brand of Catholicism has been made by new missionary observers. We parents have been encouraged to abdicate our responsibilities/duties for our kids' religious life to an elaborate well meaning school system. The adolescents then discard their faith practice with their school bags. If faith were 'taught' intellectually as we once assumed, schools would be a logical response. But it's 'caught'. Unless an equally elaborate and expensive system is established to support parents and relationships and theology of parenting and domestic prayer life, we will continue to slide. We will continue to take the shadow for the substance and choose the school option over Sunday Mass. Let the conspicuous richness of an old Nigerian culture enlighten our sometimes thin smug misguided materialist follies. Families are where our immense resources should be focused and where habits of love can flourish. Jesus didn't start a school. White haired women in the pews are the disregarded prophets to construct a wiser way of sanctifying our desperate young. Just like the elders in Nigeria. We have so much to learn from these young men and their generosity. They will need grace to persevere. Vegemite and temperature are not the worst of it. I viewed the first eposode. I have worked with this issue as a Parishioner and Parish worker. I have serious concerns about the practice. It really must be a stop gap measure while we address the issue of falling vocations in the Australian Church. I support the comments of Leander Gonzaga. I disagree with JM Buzan. The abuse issue is a serious one, but declining vocations were a fact before the scandal finally broke. I was a school boy in the late 1950s early 60s, vocations were at their peak. A number of my fellow students went from year 6 straight into the Juniorate, for priests and brothers. It was a cheap way for parents (often with an Irish background) to give their children a sound secondary education. I suspect that the reason for many vocations was not always for a life of priestly service. I know people in the teaching profession who are ex nuns brothers and priests. Affluence and acceptance in the 1960's/70's by mainstream society of the Catholics, typified by state funding of Catholic Education, allowed many to socially advance. The need for seminary or junorite education dimminished as a result. The numbers being ordained or joining religious congregations declined. I rest my case! I have seen the film and find Tim's analysis almost insulting to the Church in Tasmania. Fr Kene turning his nose up at Vegemite couldn't be construed as sneering. The priest who gets tense with Fr Christopher doesn't realise that in Nigeria, Christmas isn't a major celebration - especially along the commercialism that we so readily absorb. Respect consists in more than nomenclature. While these children are lining up (or being lined up by their parents) for seminary, what are they leaving? The sort of life expectations that led to young boys being sent to monasteries centuries ago in Europe? Would one of the tasks of the Nigerian Missionaries be to encourage local vocations and so build up an indigenous church? There is one truth, if a sad one, that these three Nigerian missionaries may learn during their three years in Tasmania: that the one holy catholic and apostolic church is not the same in every country; that it contains many dispirited people; that one particular church may not be as apostolic as another. And if they look at the history of the catholic church in Australia they'll learn that Ireland once was as Nigeria is today. The priests' concern with the disconnect between sending children to a catholic school and going to the sacraments I share. Catholic education is not producing the priestly and religious vocations of the 50/60s. My solution would be to close all catholic schools and re-introduce Sunday schools. Think of the resources (human & material) that would free up. The attendances may be small but the kids would know Mum & Dad took religion seriously and they would be taught by dedicated and committed catholic educators. Let's hope Christopher learns to call his mother "Your Holiness" if she continues to call him "Father". Sounds like he loves the power and deference of being the "Father". This style of power trip was a main aspect of the child abusing priests/bishops in Australian parishes. Someone should help these Nigerian priests to understand the culture in Australia. The views they have of women are not going to help them be accepted by Catholics or the victims of child abusing clergy. It is an ill thought through move to bring these people to minister in Australia. They would do better working in their own homeland with their own people. I can understand some bishops' recourse to the importing of priests from the Third World to plug gaps. I've also seen an awful lot of it, especially in some North American dioceses, It is rarely a great success, for the importees' motivation is usually lucrative. The situation with Third-World export of priests is analogous to that of Ireland in the 1930s, when there was a surplus of "vocations" and some seminaries were solely for export (All Hallows and Carlow come to mind) - some Australian dioceses (Bathurst is an example) discouraged Australian vocations at that time because they had standing contracts with such seminaries. However,from the late 1970s, once there was an economic boom in Ireland these export vocations totally died out. Pause for thought? The solution is not resorting to importing priests from the Third World, but renewing the professional, cultural and spiritual profile of the priesthood in Australia - and the key is doing something about the truly wanting seminaries. All Hallows College was a 'for export only' seminary from its foundation in 1842. The founder, John Hand, wanted it to train missionaries for non-Christian lands, but the Irish bishops, whose own seminaries were unable to keep up the supply of clergy for the Irish diaspora, insisted that it be re-oriented towards the Irish abroad. About 80% of the Catholic clergy of Australia in the 19th century was Irish and most of those graduates of All Hallows College. Archbishop Polding regarded it as a hotbed of vulgarity and Fenianism, a judgement which needs to be seen through the prism of Polding's anglicised, Benedictine vision of the Australian Church. Although one does wonder at the prohibition in the College handbook on students' "spitting in the chapel or otherwise soiling the pews and floor". Bathurst was not the only diocese that discouraged Australian vocations until well into the 20th century. Most of the Irish bishops in Australia regarded the local youth as unsuitable for the priesthood because too independent and "larrikin". The Irish were aghast at the rise of Australian clerical nationalism in the 1920s and 1930s associated with the Manly Union. Archbishop Duhig of Brisbane complained about it personally to Pope Pius XI. The Irish objection to Australian vocations started to waver only with the appointment of Australia's first two native-born metropolitan bishops, Gilroy of Sydney and Beovich of Adelaide. Four diocesan seminaries in Australia are doing well in terms of both recruiting and preparing/educating committed priests - Good Shepherd, Sydney, Corpus Christi, Melbourne, St Charles, Perth, and St John Vianney, Wagga Wagga. (Wagga Wagga is the one Australian diocese that does not have a shortage of priests thanks to St John Vianney College, much reviled by the "liberal" establishment when it was founded as a prophetic act by Bishop William Brennan.) What all the above seminaries have in common is an intellectually-informed, affirming, positive attitude towards the historic, orthodox theological traditions and an encouragement of a personal spiritual life of prayer among the students. The seminaries that do not do this - the few that are left - are failures. There is no vocations crisis in the Australian Catholic Church for the Holy Spirit is calling just as many young men to priesthood as She always has. Today's problem is the mismanagement of the vocations we've got. Perhaps the reference to Australia's former importing of Irish clergy is not entirely relevant to the present discussion. Let's recognize that so many Irish clergy came to Australia because Catholics in Australia were predominantly Irish. Similarly, Polish priests were imported to look after the Poles, and so on. But here we are talking about an entirely different kettle of clerics. How many Nigerian Catholics are there in Tasmania? The Holy See has expressly criticized the practice of advanced countries helping themselves to priests from the Third World (cfr. the 2001 “Instruction on the Sending Abroad and Sojourn of Diocesan Priests from Mission Territories” of the Congregation for the Evangelization of Peoples) - for the simple reason than that even though in some mission countries there might be more vocations than in the West, the proportion of priests to Catholic faithful is much lower. Is the ratio priest:people in Nigeria higher or lower than in Australia? I suspect lower. It reminds me of a diocese in Sri Lanka experiencing such a shortage of priests that one octogenarian Irish missionary has to celebrate ten Masses each Sunday, yet 70% of its indigenous clergy is working in the USA. I don't think the issue of race matters when it comes to Catholic priesthood and communities. The Catholic Church is, after all, itself a vast cosmopolitan, multi-ethnic, multi-cultural conglomeration of peoples and cultures. The Church has historically operated on an internationalised basis. There have been Bishops of Rome who have been Palestinian, Syrian, Greek, African, Polish, German, etc. One of the earliest Archbishops of Canterbury was Greek. The Bishop of Salisbury in England at the end of the medieval period was an Italian - and so on. The fact is that if Australian Catholic families, parishes and schools do not provide vocations to the priesthood - and that is the only possible source of local candidates - and if Australian Catholics continue to want to go to Mass and celebrate the sacraments, then priests are going to have to be imported. They can't now be imported from Europe and America which have their own priest shortages so they will have to be imported from the so-called "Third World" of Asia and Africa. If not, the sacramental system will simply fade away and we will end up as Congregationlaists. Western civilization is dying; and the church, in so far as it is part of western civilization, is also dying. The church thrives in Africa because Africa is alive -- in pain, perhaps; struggling, certainly: but alive. The church's future is not with the dying "west", but the emerging "south" -- or to be more accurate, it is not with the rich but with the poor. And that is as it must be, ever has been, and for ever will be. My hope is that when the missionaries return to Africa they will realize that the future of the mission is with Africa. I have watched both episodes of this documentary with interest. I am not Australian born, and am irritated by assumptions of cultural superiority extended to the portrayal of 'foreign' priests. So it is a crime not to like Vegemite, to adhere to a more formal mode of address and a more devotional style of liturgical practice. Most of the good things about Australian 'çulture' turn out to be values shared by most western style democracies, freedom of speech, gender equality and respect of human rights (up to a point). The rest is totally superficial. If these 'foreign' priests were white Americans or Canadians, I suspect there would be less sniping, even if they were more formal in manner or more 'devotional' in practice. Some of the comments suggest to me that the real beef with foreign priests is that some fear it may make the case for relaxing the celibacy rule less immediate. If indeed the case for married priests (or women priests for that matter, which I personally think would be a good idea) is a good one, it will happen eventually through the usual processes of discussion, deliberation and slowly moving bureaucratic advances. Don't make these fine dedicated young men, not only from Africa but from India and Sri Lanka and elsewhere into a political football for those disaffected Catholics with an agenda! This has been coming for decades. The Church in Australia has been badly let down for decades by Bishops and priests that have not been teaching true Catholic Doctrine. The loss of Catholic numbers is their fault. Now Australia is missonary territory. Wishy Washy so-called Vatican II nonsense has prevailed instead of Catholic Doctrine. That's it in a nutshell. all who grow up free to choose .. Find they serve you.